The first of two canonical 19th-century novels, Noli Me Tangere revolves around Crisostomo Ibarra who, after a seven-year stay in Europe to study, comes home to his town of San Diego, brimming with the desire to contribute to the development of the townspeople. More specifically, as a reformist, he aims to make education accessible to more people. His idealism, however, cannot bear fruit because of insidious forces bent on destroying him. Ibarra learns that his father, Don Rafael, had been embroiled in a conflict with Padre Damaso, who eventually causes his humiliation and death. It is not only political power that the friar wields; he has also used power to seduce the mother of Maria Clara, Ibarra’s sweetheart. Ibarra has another enemy in the person of Padre Salvi, who lusts after Maria Clara. It is also Padre Salvi who almost causes Ibarra’s death at the groundbreaking ceremonies for the school. Things come to a head when Ibarra is implicated in a failed uprising instigated by Padre Salvi. The young man is imprisoned but is eventually rescued by Elias, whose life Ibarra has saved in the past. As the novel ends, the thoroughly disillusioned Ibarra sees a bleak future. NOTES: This novel has been a rich source of insights into the history and culture not only of 19th–century Philippines but, as importantly, of the 20th century as well. Its generally realistic perspective offers the reader a panoramic view of a conflicted and deeply divided colonial society. The characters in the novel stand out as recognizable types of individuals, both from the ruling class and the oppressed, and the struggles they undergo are indices to the turbulent conflicts in the 19th century. The novel is also significant for the specific ways in which it has shaped the trajectory of realistic novels in English and Filipino. Such Filipino writers as Iñigo Ed. 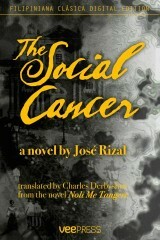 Regalado, Faustino Aguilar, Juan C. Laya, Stevan Javellana, Nick Joaquin, among others, have been influenced by the themes, motifs, and characters of this novel. Executive summary written by Soledad S. Reyes, Ph.D.
Buy the ebook version from VeePress!